We're continuing our Colorado-themed Down On The Street Bonus Edition Sunday with this Mini Cooper I shot in Boulder last fall. This must be the newest pre-BMW Mini I've ever seen in the United States. My Mini-identification skills aren't so good, but I'm guessing that this car is an 80s or 90s model, no doubt imported through a terrifying bureaucratic obstacle course. 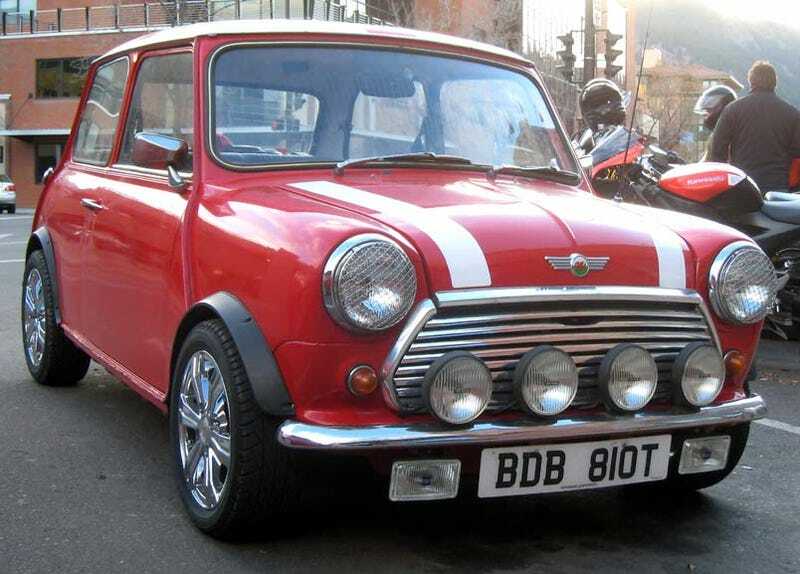 Any of you deranged devoted Mini zealots fanciers who'd like to give us your read on this car, please do. I'm not quite sure what the combo of Welsh dragon hood ornament and English flag-painted roof symbolizes, other than "Hooray for British cars!" Is this the American equivalent of having a big ol' GMC pickup adorned with a Confederate flag and an "I ♥ NY" bumper sticker in Britain?